Down & Dirty: My contest entry! The challenge is to submit a photo of a plant native to your region that you think deserves more attention than it currently gets. Originally they wanted the plants to be water-wise, but that's no longer one of the criteria. I took the above photo last year, first week of May. The tree is one I planted on the ferny verge between our cultivated space and the un-manicured, surrounding woods. For years I've sung the praises of Amelanchier candensis to anyone who will listen. I use it whenever I can, both in my Pennsylvania landscape and in my business in NYC. It's a low maintenance plant, with four seasons of interest, and anyone looking for a small tree or shrub should consider it. Different species of Amelanchier are native to different parts of the U.S., so there are plenty to choose from depending on where you are. They have many common names: shadblow, serviceberry, and Juneberry being the most common in my neck of the woods. Some people call it shadblow because the flowers (blow is an archaic word for flower) bloom when the shad run. 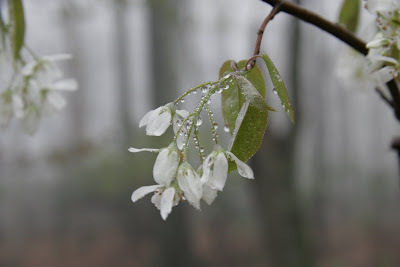 The name serviceberry comes from colonial times. Flowers bloomed when the snow had melted enough for the preacher to walk to church and perform the first service of the spring. I prefer Juneberry because it conjures neither religion nor fish. 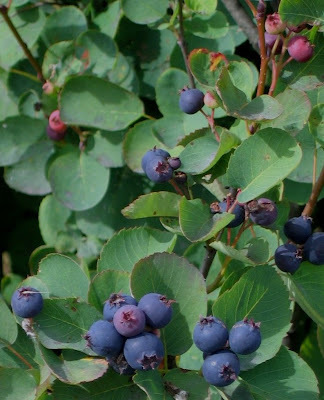 Juneberry requires no supplemental water once established (making it, nudge-nudge, water-wise! ), is relatively deer resistant, and tolerates a range of growing conditions: mostly sun to mostly shade, rocky soils, rooftop containers. There are few trees that offer so much and demand so little. The plump, unopened buds are held widely spaced, like a candelabra. They're white, edged in pink and just this week I've been struck by their beauty. Sadly, my attempts to photograph them have thus far been thwarted by high winds. Small, white flowers follow, often before its leaves emerge and before neighboring trees have started new growth, they flash white as you drive past and in the spring garden, they’re a bright focal point. In early summer, clusters of berries attract birds to the garden. Juneberries are slightly bigger than blueberries; they start out red, and ripen to a deep, purply-blue. In fall, the foliage is bright yellow, turning orange, and it’s one of the first trees to drop its leaves, revealing what some consider its best attribute: beautiful bark. In fact some people prune off the bottom branches of the tree to show off its slim trunks, subtly marked with vertical, silvery stripes. They look lovely against the snow. Even among those who appreciate the beauty of the Juneberry, few appreciate the taste of its fruit. Juneberries are delicious and firm, tasting something like a cross between blueberries and strawberries. Its seeds are small and plentiful, unobtrusive to chew, and adding an almond flavor. They don’t all ripen at once, so you can harvest juneberries for about four weeks. A single tree produces a prodigious harvest. The berries are delicious eaten out of hand, and they freeze well. I’ve dried Juneberries for cereal and salads, made Juneberry-peach compote (below), Juneberry sorbet, and Juneberry-rhubarb jam. This year I've got a tart recipe to try out. Seriously, what more could you ask for in a woody plant: striking flowers, tasty fruit, colorful foliage, ornamental bark, and so very easy to grow. What's stopping you? I have the perfect space for one of these in my yard! I will tell my husband to buy (and plant!) it for me for Mother's Day. We'll see if he can follow directions . . . I say you win! Lovely image of my favorite tree. We are just at that almost-in-bloom moment here. Your contest photo is definitely a winner! The Amelachier you gave me is covered with buds--should be a good year. Sarah, too bad Mother's Day isn't next weekend or I could help you plant it! Maybe you can convince JBJ to give you an early present. Sara, I haven't forgotten you promised me an Amelanchier tart...save those berries! Leda, too early for buds here in PA; here's wishing you a bountiful crop! I know it as Serviceberry but prefer Juneberry so I'll start calling it that too. I need to go take a photo of an old tree that I know of. Standing alone on a rocky ledge it's a real beauty. Hard to believe but it's not offered for sale at any of the nurseries around here. I love them and I am lucky to know a farmer her in WI whose father did some breeding work with service berries and they let me come pick. Beautiful, atmospheric photo! I love Amelanchiers. The only reason I don't grow one is that my next-door neighbor does! We don't have that amelanchier here in California, but do have a couple of others. They're beautiful big shrubs more people should grow. James, have you ever tried the fruit of your native Amelanchier? Since you're in CA I'm thinking it may be A. alnifolia (aka Saskatoon). I'm curious to know if it's a tasty one. MMD, lucky you indeed! Does your neighbor let you pick? Leedav, since you're such a foodie, maybe you'll come up with a fabulous Amelanchier recipe. Please share! Wiseacre, I think you should start asking for it at your local nurseries and tell everyone you know to do the same. Maybe you can create a demand. Love the detail Ellen, but the photo would benefit by a little exposure compensation and the contest wanted to see plants in a garden. I "got" that it is water wise - all natives are in their own habitat aren't they ? And in the South you'll hear it called "sarviceberry" - the first vowel clearly becoming a long A sound. Kind of like how we say, "foliage" but different, huh Ellen?